Everyone loves tucking into a delicious chicken dinner or a lovely slab of steak- but what’s the worst thing that can happen when you eat meat? That’s right, trying to chew your way through something that’s devoid of any flavor! Marinades and sauces might add a touch of flavor, but it rarely sinks into the meat and makes a lasting difference. Thankfully, there’s a solution in the form of meat injectors! Naturally, some of you out there may be entirely new to the idea of injecting your meat. As such, you don’t want to pay for something that’s overly complicated and too hard to use. Thankfully, the GrillHods Meat Injector is the complete opposite of that. It’s very affordable and is so easy for anyone to use. In fact, it’s this ease of access that gives it a place on my list! There’s a comfortable 3-hole hand grip that makes holding the injector a breeze. Couple this with the extremely sharp and durable needles and it’s almost impossible to go wrong. The marinade injector has a 2 once capacity which means you can keep injecting your meat with as much flavor as you want. There are also three needles; two 6 inch ones and one 3 inch one. This meat injector is also very easy for you to disassemble and put back together again. Plus, to make your life easier, it’s dishwasher proof! So, this makes it extremely easy for you to clean. We’ve seen the good, so it’s only right to see the bad as well. What’s wrong with this product? The majority of complaints about this meat injector revolve around the build quality. Some customers complain that the needles didn’t screw in properly, while others felt like theirs was only one accidental drop away from breaking. So, yes, you don’t have to pay a lot for this product, but when you sacrifice the price, you also forfeit the quality somewhat. Now, I tend to separate meat injectors into three different categories. You have ones for advanced cooks that are continually cooking meat and looking to try out new marinades and flavors all the time. Then, you have sort of middle of the range ones that aren’t quite commercial quality but are fantastic for people at home that have a lot of barbecues or like to cook meat fairly regularly. Finally, you have meat injectors for people that might use it now and then when they’re preparing a special meal. The Bayou Classic fits into that final category; it’s for people that just want a cheap meat injector and aren’t worried about any unique features. The key selling point of this product is undoubtedly the price. It’s so cheap, and you get a fair bit for your cash as well. There are two different needles, it’s made from stainless steel, and it’s pretty easy for anyone to just pick up and use. With the needles, one is designed for liquid marinades while the other is for chunkier and more minced-style marinades. It’s not the biggest product out there, which makes it perfect for the type of person that just wants to use it every so often. When you don’t need it, it can fit away in a drawer or cabinet with ease. However, there are a fair few negative points, which you’d expect from something so cheap. For starters, while you do get two different needles, they’re both the same size. So, you can’t really use this with meat that’s either really thin or really chunky. Not only that, but loads of customers said they lost the O-rings that sit at the top of the injector. They can fall off easily, though it’s supposedly easy to replace them too. It’s also said that the minced needle injector isn’t really that great. A lot of people said their marinade got stuck, so they only used the liquid one. I spoke earlier about the different meat injector categories, and this one falls into that mid-range pile. It’s almost double the price of either of the previous products, but it’s aimed at a different type of person. 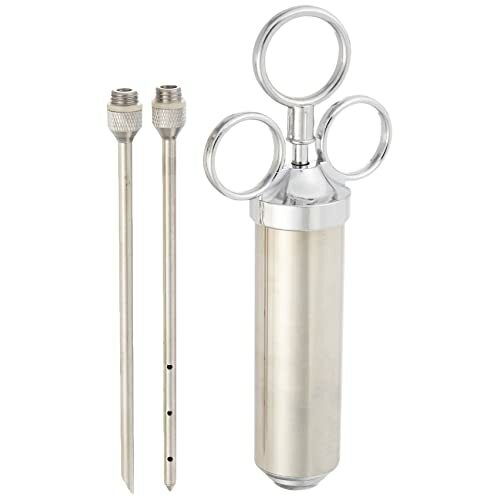 For me, this is a meat injector that’s ideal for BBQ enthusiasts. It’s something you can use time and time again for weeks on end and still see fantastic results. This is probably the best mid-range meat injector you can buy regarding sheer quality. You don’t just get an injector with a few needles, you get an entire kit as well. Inside the box, you will find three different style needles, custom needle cleaning brushes, replacement rings, and an eBook that provides advice and recipe ideas. I love this product because it can be used with other things as well as meat - such as injecting donuts with a filling. To round things off, it’s made using high-quality, aluminum-free materials. This makes it 100% safe for your family to use with any type of food. When you take into account what you get for the price, there’s not a great deal to complain about with this meat injector. I suppose one downside is that it’s not dishwasher-safe. The good news is you get those cleaning brushes to make life slightly easier, but it would be much better if you could just stick it in the dishwasher and clean it. Another possible negative is that it’s quite stiff when you first get it, so your fingers do hurt a bit after the first few uses. The Grill Beast meat injector isn’t the cheapest product on this list, but it’s undoubtedly the best value for money offering out there. you get so much for your money. It comes with professional-style marinade needles that are of really high quality. These needles feel really sturdy, and they are all completely different as well. One of them is 6 inches in length with lots of holes in it for liquid marinades. There’s another 6 inch one with no holes and an angled cut for slightly chunkier marinades. Lastly, there’s a smaller, 3 inch one, which is ideal for precision injecting of smaller chunks of meat. The meat injector is designed to be easy for you to hold in your hand and grip. As such, it’s relatively simple to use, and it’s not too uncomfortable for most people. Another thing I like - which adds even more value for money - is the fact you get an eBook free of charge as well. This will teach you how to use and maintain the meat injector, as well as providing a whole host of detailed tips too. All in all, excellent value for money, but there are some less than impressive talking points to touch upon as well. Most notably, people with small hands have complained that it’s a bit too big for them to use, so bear that in mind. What’s more, you can’t clean it in the dishwasher, and there aren’t any cleaning tools included. If you’re looking for the absolute best meat injector on the market, then this one takes the crown. It’s a commercial-quality injector gun, which means it’s used in actual restaurant kitchens by proper chefs. So, you already know it has to be good for real chefs to use it! You get a whopping 4 different commercial-grade needles that are so strong and sturdy. They’re also the most reliable needles out of all the one's reviews as they clog the least and can handle thicker sauces and marinades. The style of this meat injector is clearly very different from anything else on the market right now. It comes with a unique way of injecting your meat in that you hold it like a gun. It may look strange, but it honestly makes things far more accessible for you. You can really be precise with this as well, and it even lets you alter the dose from 1ml to 5ml. The whole kit is brought together with a lovely case to keep everything in as well. Okay, let’s talk about the elephant in the room; the price. You’ve already seen how much it costs in the table at the beginning of this list, and there’s no denying it is costly. So much so that a lot of you will probably not buy it as there are great products what you pay for this one. Yes, the price is a downside, but it’s probably the only negative alongside the fact you can’t clean it in the dishwasher. Do you want to get your hands on the absolute best meat injector with the highest-quality needles and performance out there? If you don’t care about the price and just want the best of the best, then get the SpitJack Magnum Meat Injector Gun. On the other hand, if the price is your only prerogative and you want the cheapest option that’s still pretty good, then go for the Bayou Classic. 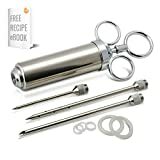 For those of you that are beginners to meat injecting and just want something nice and comfortable that’s not too expensive, then the GrillHogs Meat Injector will work perfectly for you. The Premiala Awesome Meat Injector is a great kit that has everything you need and more. This is for anyone looking for a mid-range product that’s not quite commercial-quality but is more reliable and better than the cheaper options. Lastly, if you want the overall best value for money option, then I think the Grill Beast is your best bet. Weigh up your options, think about your needs, then make a decision that’ll suit you best! Then, sit back and enjoy your brand new meat injector and all the flavor it brings. KITCHENMINER IS A PARTICIPANT IN THE AMAZON SERVICES LLC ASSOCIATES PROGRAM, AN AFFILIATE ADVERTISING PROGRAM DESIGNED TO PROVIDE A MEANS FOR SITES TO EARN ADVERTISING FEES BY ADVERTISING AND LINKING TO AMAZON.COM.